According to a new poll published by Pew Research, U.S. citizens are more concerned about the potential violations of their civil liberties from anti-terrorism measures (such as NSA surveillance) than the threats such measures supposedly aim to stop. 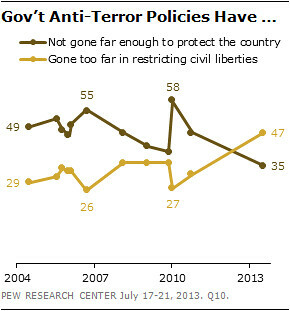 As seen in the graph below, a significantly larger percentage of Americans (47 percent) feel as though government anti-terror policies have “gone too far in restricting civil liberties” in contrast to those (37 percent) who feel such policies have not gone far enough. As Pew’s data shows, what’s remarkable about this shift in public opinion is that it holds true across the political spectrum, as both Republicans and Democrats show greater concern about their privacy rights than about terror threats. The effect Edward Snowden’s revelations is having on public opinion in America cannot be understated, for since the infancy of the ‘War on Terror’ and its resulting military and intelligence efforts, Americans now see government intrusion as a greater threat than terrorism itself. In fact, Pew reports that 56 percent of Americans don’t feel that there are appropriate checks on NSA surveillance, and a whopping 70 percent think the government uses surveillance data collected on U.S. citizens for things other than investigating terrorism. 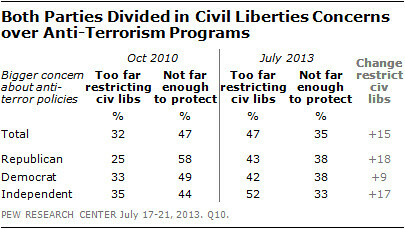 While Americans narrowly approve of anti-terrorism surveillance (50-44), the data indicates that this is due to a view that, if applied correctly and with the public’s civil liberties in mind, such surveillance is a positive and necessary thing. However, just like the Google engineer who recently won an NSA award, and then expressed that he’d rather see the NSA “abolished than persist in its current form,” a growing number of Americans are expressing opposition to the current state of U.S. intelligence activities.